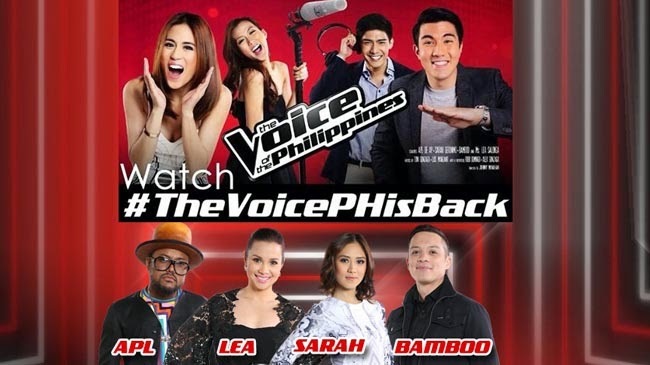 The Voice Philippines coaches Bamboo, Sarah Geronimo, Lea Salonga and APL de Ap are back on their red seats on October 26, ready to push the buttons and lead a team of artist until one will be hailed as The Voice on the Philippines. ABS-CBN had finally announced the start of one of the most anticipated singing competition in the country. The Voice reached out to the whole country to find talents waiting to be discovered. As seen in the trailers, even the coaches are excited to meet people not only able to sing but also has an exceptional talent ready to amaze the whole country. The Voice is about reaching a dream through hardships through singing. In the sneak previews, the people who had auditioned came from all walks of life, from a police officer to a balut vendor. The prestigious singing competition aims to give hope to many that dreams are possible as long as one hold on to it and never give up. Coaches are ready to fetch the talents and are willing to outdo each other’s antics to gain the talent’s approval. Many also look forward on how they will make a talent choose for them if more than one coach turns a chair in the blind auditions. Post by The Voice of the Philippines. Geronimo and Salonga’s fights for recruitments in the past seasons had been talk abouts, and people will be waiting for more of it this season as both will boast her title and achievements. In the first season of the show, Mitoy Yonting of Team Lea had won the hearts of the Filipino’s and grabbed the winning title as ‘The Voice’. The Voice Kids was likewise viewed by many avid viewers as Lyca Gaironod won the title under Tean Sarah. The Voice also promises more surprises to the audience and talents alike. Don’t miss the journey of the talents and coaches as they race for the title of ‘The Voice’ once again beginning on October 26.